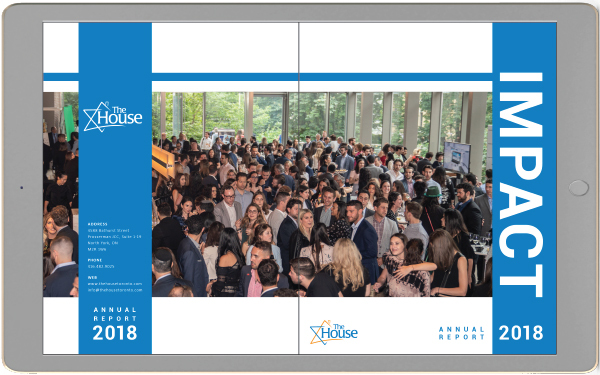 WE ARE EXCITED TO SHARE WITH OUR SUPPORTERS THE HOUSE 2018 IMPACT REPORT, OUR FIRST-EVER ANNUAL REPORT! In 2017, The House’s Board of Directors made a critical organizational decision to respond to the alarmingly low participation-rate by Jewish young adults in organized Jewish community life. According to UJA Federation, fewer than 5% of Toronto’s 42,000 Jewish young adults (between the ages of 22-39) engaged in programs offered by UJA and its 100 affiliate agencies – most of them on a one-off basis. This staggering statistic sparked The House Board to develop its bold, five-year strategic plan focused on strengthening the Jewish identity of 5,000 young adults annually by 2020 – a significant number because it represents one quarter of the 20,000 Jewish young adults living South of Steeles to the lake. Launched in 2018, our strategical plan called for an increase in total House program participants, new participants, and repeat participants, all with increased access to learning Jewish values and wisdom. We are grateful to be able to present to the community The House’s first Annual Impact Report outlining our increased community and individual impact in 2018. To review this report with a member of The House team, or to learn more about how to support and/or partner with The House, please contact us.